JR2000B patient monitor is easy to carry, with 800*600, 8inch color TFT-LCD screen, size of main unit is 175*210mm, thickness is 80mm, weight of main unit with battery is 1.35KG. Packing carton of each unit is 13*38*27CM,weight of patient monitor with accessories and packing material is 2.6KG. 1.Waterproof design appearance, low power consumption, without air fan and silence, battery working time is at least 5.5hours,recharge time is2.5hours.Suitable for medical field rescue, ambulance, move and transit..
2.Display mode of big font, trend review, ECG 7 lead, support one key operation, touchable screen is optional. Suitable for all working places, can used for neonate, child, adult and veterinary; support mode of diagnose,monitor and operation. 3.15 type arrhythmic analysis,7-lead ECG waveform display in phase. 15 type drug calculation and titration table. 4. Efficient resistance to interference of defibrillator and electrosurgical cautery, respiration can choose III,meet requirement of operation, ward. 5. Use digital SpO2 technology,can test for 0.1% weak,high accuracy. 6. Anti-ESU,anti-defibrillator,RA-LL impedance respiration,digital filtering. 7. Double over-pressure NIBP protect,temperature drift. 8. 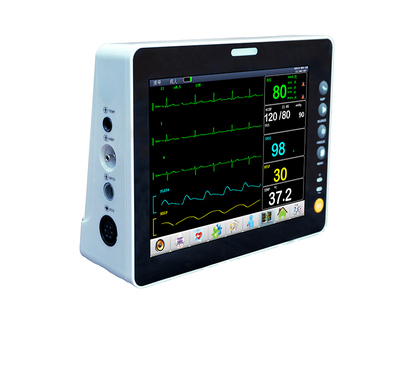 Optional functions:Touchable screen, EtCO2, Central Monitoring System.